Mozilla Firefox is always been no.1 choice for web developers because on the compelling reason, i.e., it has a large collection of add-ons that are free to use, easy to install and work right inside the browsers. These awesome Firefox add-ons makes your browser more efficient and also helps you to do your designing and developing projects easier. It is also very popular among the CSS developers. CSS helps developers to create beautiful and attractive webpages. There are loads of add-ons that CSS developers use to save their time and make developing much easier. So today, in this article, I am going to share Best Firefox Add-ons which will help to perform various functions that CSS developer need in their day to day life. Alternatively, you can check our previous article on Best Free Online CSS Editors that can help you to change or edit the CSS code online. 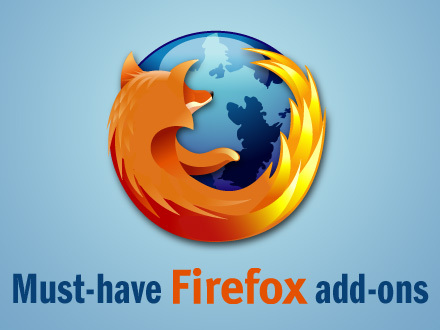 So, have a look on SaveDelete’s compilation of 15 Must Have Firefox Add-ons For CSS Developers. And if you use any other add-on which you feel suits best in this list, feel free to share with our readers in the comments section below. 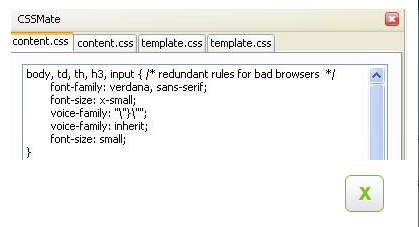 1) Aardvark : Powerful and user-friendly selector utility for selecting elements and doing various actions on them. It can be used for cleaning up a page prior to printing it (by removing and isolating elements), for making the page more readable, and (most appreciated by web developers), for analyzing the structure of a page. 2) CSS Usage : CSS Coverage is an extension for Firebug which allows you to scan multiple pages of your site to see which CSS rules are actually used in your site. Open up the first page of the site you want to check and press the “Scan” button in the “CSS Coverage” Firebug tab. Each time you press “Scan”, the CSS files that are included in the current page are shown with the number of times the rules has been found applied on your page before it. 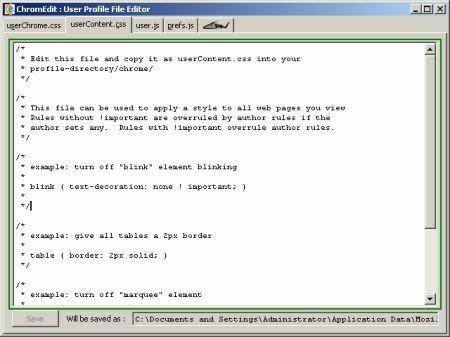 3) ChromEdit : A Simple User Profile File Editor. Giving access to userContent.css [for adding user styles that are applied to webpages], userChrome.css [for overriding UI styles], read-only access to prefs.js and access to user.js [to make more permanent preference changes – though you need to grok the structure and possible values first ]. 4) GridFox : GridFox is a Firefox extension that overlays a grid on any website. If you can open it in Firefox, you can put a grid on top of it. It’s easy to customize, allowing you to create the exact grid you designed your layout around. More than just a handy development tool, GridFox also proves to be indispensable with the daily production of a grid-based site. Using GridFox, producers can easily check if their content maintains the grid, or if it needs to be edited. GridFox is the essential tool for creating and maintaining pixel-perfect, grid-based layouts. 5) CSSMate : This add-on involved CSS Editing. Originally a port of the fantastic EditCSS tool. When on a page that you wish to modify the CSS of press Ctrl+Shift+8. This plugin will conflict with EditCSS so you need to uninstall that plugin first. CSSMate will remain open when refreshing the page and preserve unsaved changes. 6) CSS Validator : Validates a page using the W3C CSS Validator. Adds an option to the right-click context menu and to the Tools menu to allow for easy validation of the CSS of the current page. Opens the results in a new tab. Will only work on pages that have a CSS file associated. 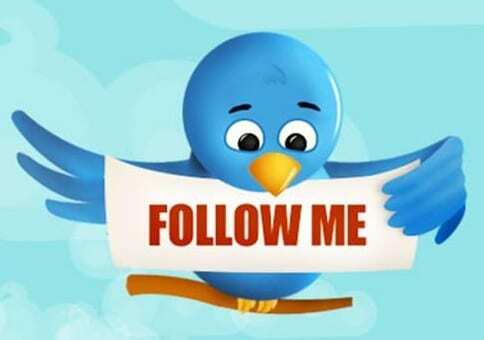 For example it will work with http://www.w3.org/ as the URL has a CSS file. 7) CodeBurner : CodeBurner makes valuable reference material for HTML and CSS available right in your browser, integrated with a range of popular development environments. The extension’s core functionality is centered around a new Reference panel, which contains a search tool for looking up HTML elements, attributes, and CSS properties. The extension also hooks into context-menus in the HTML and CSS panels, the DOM crumbtrail, and the Inspector, adding options to look up a selected item (ie. search for it in the Reference panel) or to view a code example. 8 ) CSSViewer : CSSViewer is a simple addon to view the CSS page elements. It is an extension of a simple CSS property viewer. Just install in your toolbar to use it. 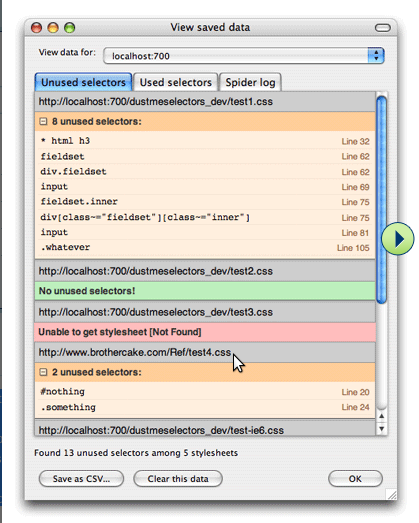 9) Dust-Me Selectors : Dust-Me Selectors is a Firefox extension (for v1.5 or later) that finds unused CSS selectors. It extracts all the selectors from all the stylesheets on the page you’re viewing, then analyzes that page to see which of those selectors are not used. The data is then stored so that when testing subsequent pages, selectors can be crossed off the list as they’re encountered. You can test pages individually, or spider an entire site, and you’ll end up with a profile of which selectors are not used anywhere. 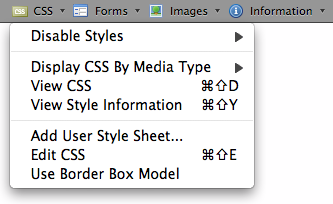 10) EditCSS : EditCSS is a stylesheet modifier for sidebar. It is really helpful Firefox add-on that includes features like live inline previewing of styles, unique grouping system, css grabbing from other sites. 11) YSlow : YSlow analyzes web pages and suggests ways to improve their performance based on a set of rules for high performance web pages. YSlow is a Firefox add-on integrated with the Firebug web development tool. YSlow grades web page based on one of three predefined ruleset or a user-defined ruleset. It offers suggestions for improving the page’s performance, summarizes the page’s components, displays statistics about the page, and provides tools for performance analysis, including Smush.it™ and JSLint. 12) Web Developer : The Web Developer extension adds a menu and a toolbar to the browser with various web developer tools. It is designed for Firefox, Flock andSeamonkey, and will run on any platform that these browsers support including Windows, Mac OSX and Linux. 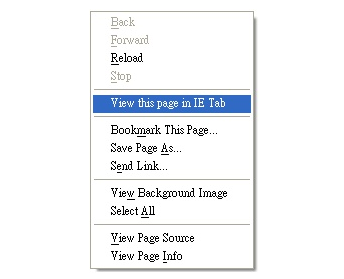 14) IE Tab : IE Tab – an extension from Taiwan features embedding Internet Explorer in tabs of Mozilla/Firefox. This is a great tool for web developers, since you can easily see how your web page displayed in IE with just one click and then switch back to Firefox. 15) Style Sheet Choose II : Style Sheet Chooser II allows you to choose author-provided alternate style sheets for a web site, and have those choices be persisted for all pages on the same site. Style Sheet Chooser II replaces Firefox’s built-in style sheet switcher – its functionality is available via the [View]->[Page Style] menu item, one-click stylesheet rotating Toolbar icon and Statusbar icon. Icons can be switched on/off via Extension Preferences.